Camp Runamuck: If Only I Had Molly Weasley's Wand! If Only I Had Molly Weasley's Wand! Imagine how quickly one could do stuff, like reorganize yarn, or maybe shuttles all shuttling across warps, clack, clack clack as the beater beats the weft in all over the house. As a kid I longed for that sort of magic and I guess I still do. Imagine! 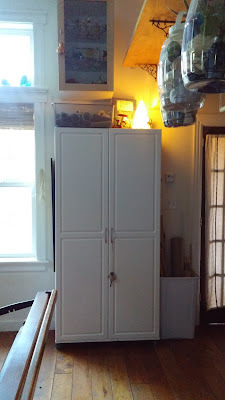 The reality is that after a very long time (and having to go with option C on the list), a new yarn storage cabinet arrived and was quickly assembled by DH. Actually, Option C is larger and higher than either option A or B, who all failed for one reason or another. Option C was also substantially less expensive. I was going to link it but Amazon has tripled the price. I paid $103.00 free shipping and now it is $300.00. Ouch! Good thing I don't want another one. It is holding all cotton, linen and hemp yarns. Gene bought and cut some additional shelves. Open shelves have been rearranged, favorite books are now displayed along with some knick knacks. 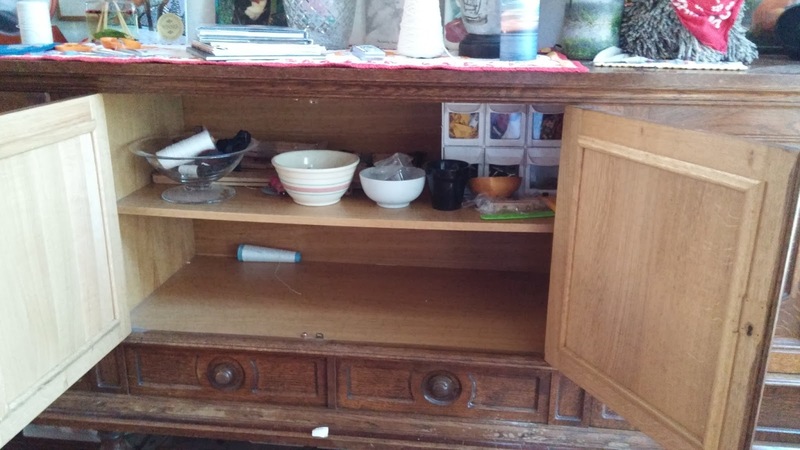 The counter space is still available. It's busy,vibrant and somewhat neat, just like a studio should be. There is also a typically weird Theresa addition. I saw this kind of creepy print (with glitter! ), at the garden show a few weeks ago and had to have it. 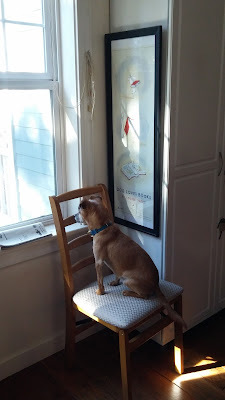 Dog Loves Books moved to the side of the new cabinet. Oh and look Dog Loves Chair! 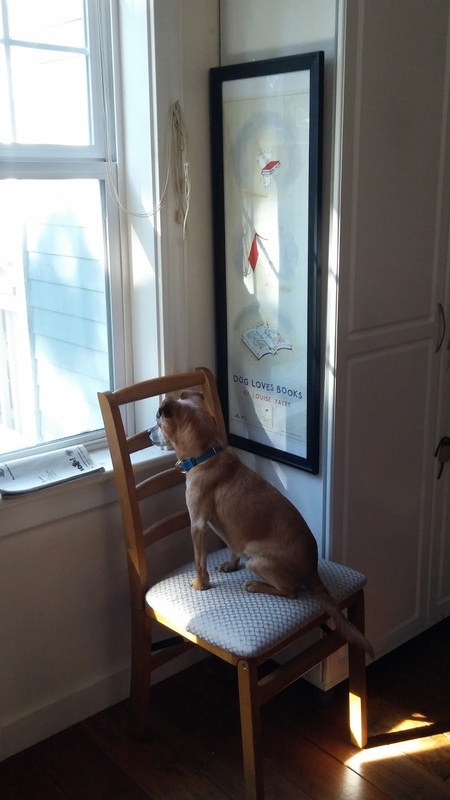 His reading skills leave a bit to be desired....squirrel watching though, A+. And there is a new warp for Nick, a honeycomb weave for place mats and/or runners. This is 8/4 cotton and some cottonlin doubled in the mix. Up in the sewing salon, just a bit got done. 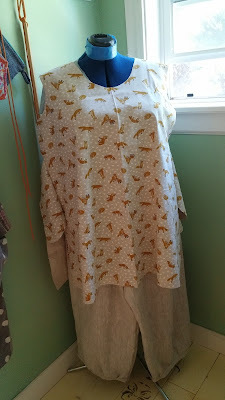 New summer pants in a linen natural/bleach mix were made and you can see this fox print tunic in process is an almost perfect match. A small quilt that I pieced and quilted 15 years ago FINALLY got bound. It needed a wash after all that time too. 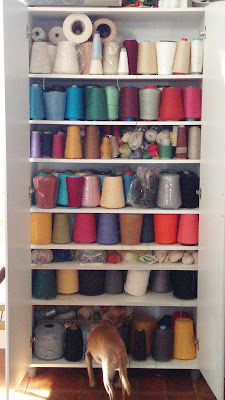 If you look carefully at the studio pictures you will see it serving as a runner on the big buffet of fiber goodness. 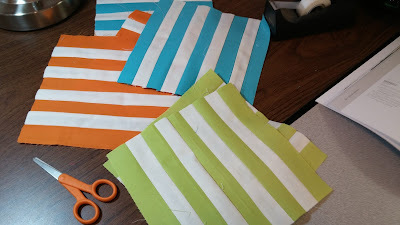 And a new quilt got its start. 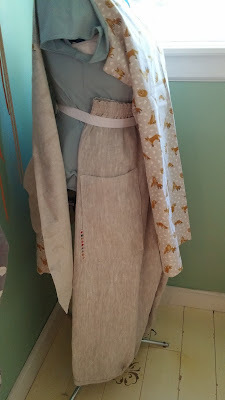 There was a lot of cutting yesterday, this fancy eyelet is also destined for summer pants. 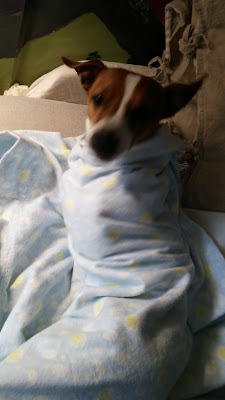 This was expensive fabric but I think they will be a lovely cool option this summer. 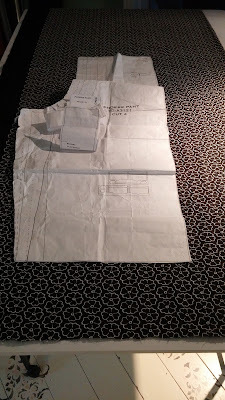 The top portion will get a half lining, like shorts inside! Black and white seems to be the order of the day. 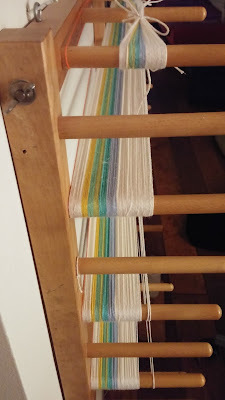 I also started in on Fiona's runner warp. I love it! It was a bugger on the measuring board but so worth it now. There certainly was little time for lallygagging last week! What goes around, comes around so I can't say I am saddened over a big game hunter killed by an elephant. Karma. terrible budget. Really, the GOP should just come clean and run on what they believe. Only rich white people should flourish in this country and the rest of you should just like, die. Now I don't truly believe all of those spineless ninnies believe that, but their leadership does. Complacent and I don't mean that kindly. Love it or hate it, Ringling Bros. has had their last show. 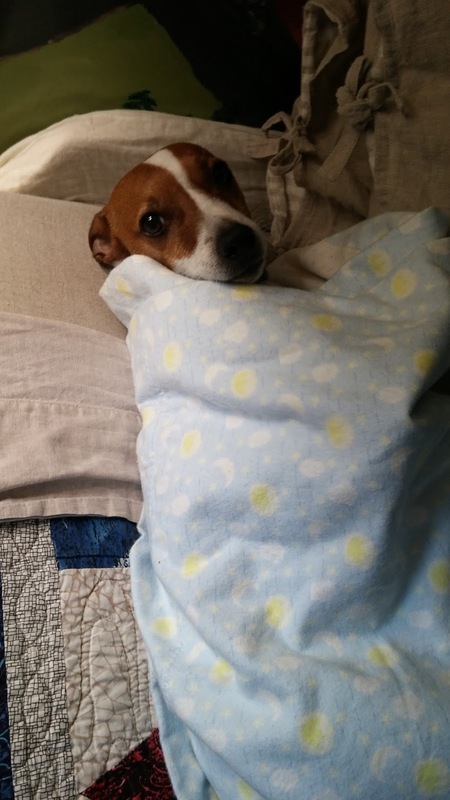 Parting Shots: Wrapped up and rolled like a burrito. 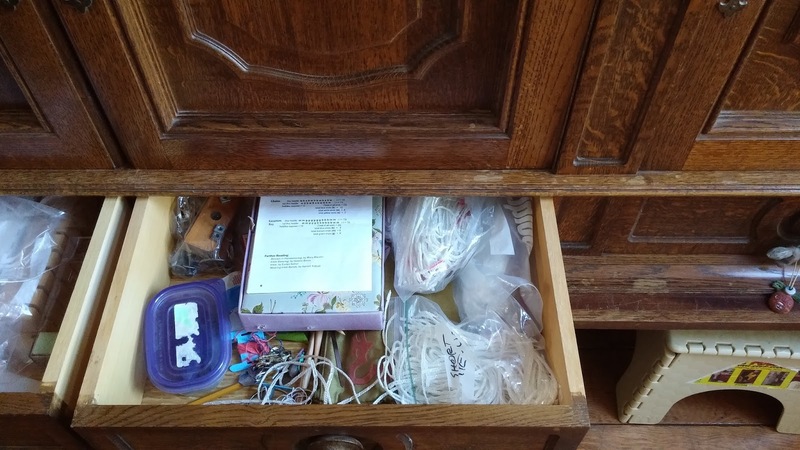 Oh my, the cabinet is great and what a boon for keeping things organized! I had to chuckle over your quilting project. 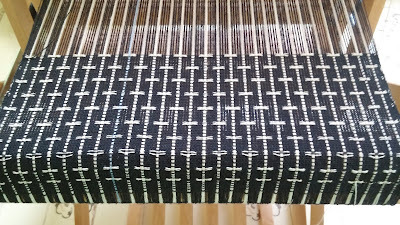 Was just talking about long-term quilting projects with another blogger. 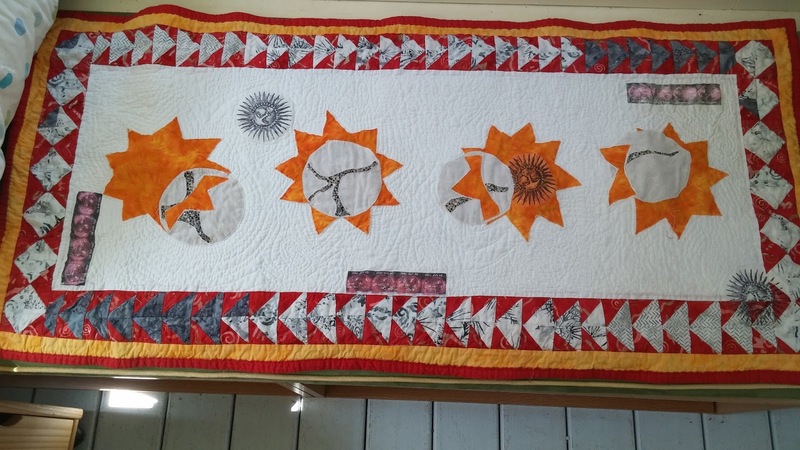 Quilts probably win the prize for longest UFOs. I love that black & white runner. And yeah, unless you're a front to back warper (which I'm not), winding warps like that is a PITA. But I'm probably gonna do more multi-colored bumberet towels, which are even worse, cuz they're just calling to me. 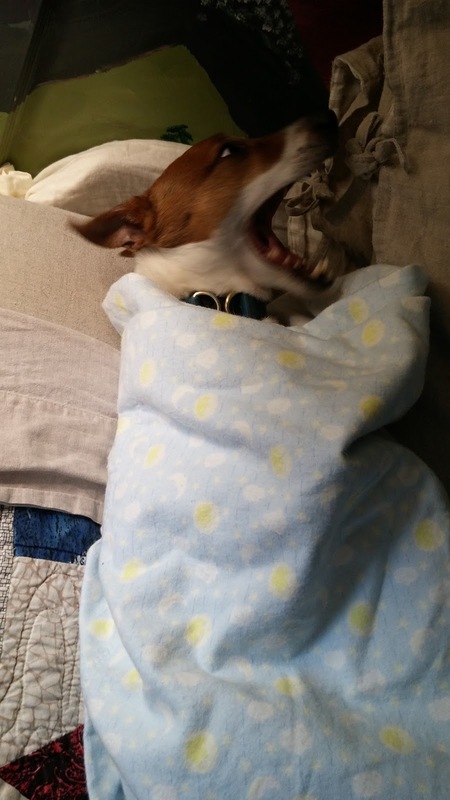 That doggie swaddle gave you some great shots. 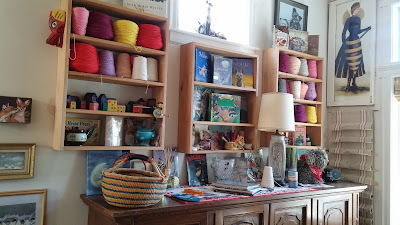 I would wish for Molly's knitting needles (since that particular fiber art escapes me!!!) But, I do have enough fiber goodness in my life...just not enough time for everything I want to do! As always, I LOVE that fox print, and the parting shot is just too cute! Fun to see everything you worked on this past week. Cindie, That wasn't quite everything but close. The re-organization was about a days time. LA, Oh yes, I forgot about the knitting needles and remember the cooking. How about we just inherent some house elves? 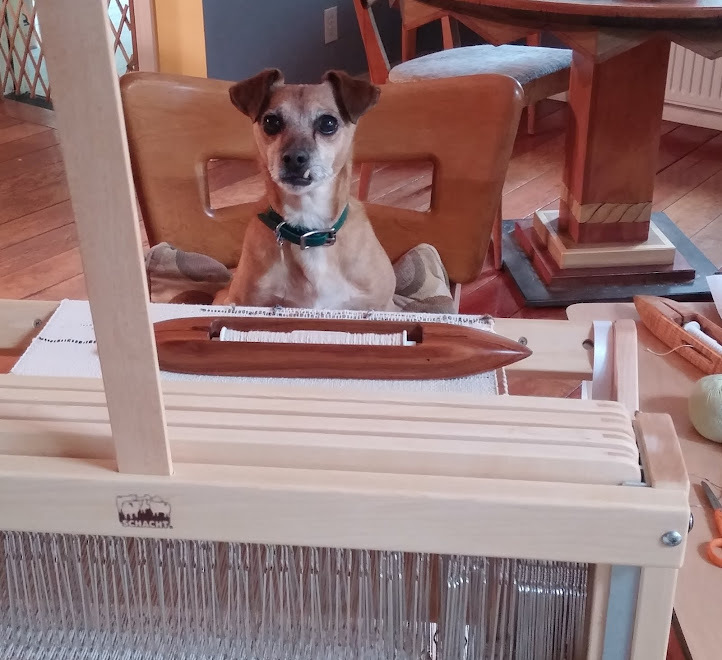 I always enjoy seeing what you are making. 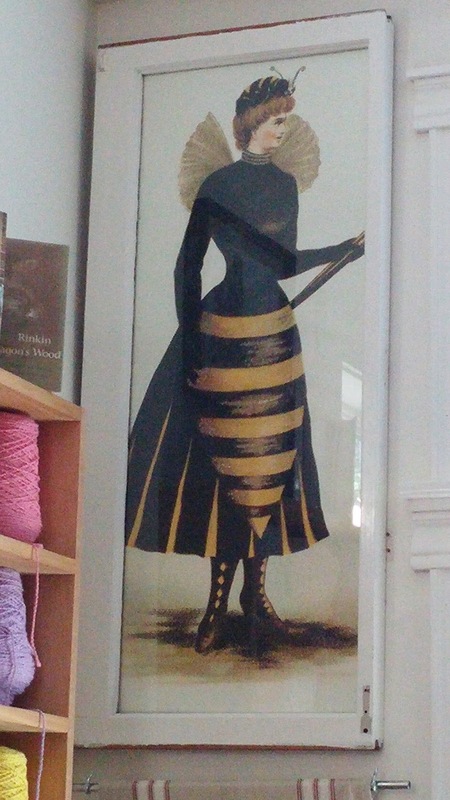 That bee/wasp woman poster might be my inspiration for next year's Mardi Gras costume-love it! Dog burritos are the best kind of burritos!